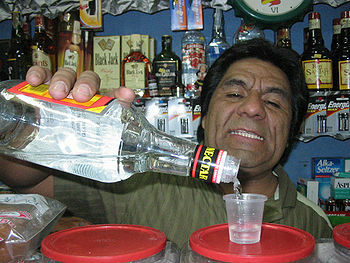 A man in Colombia pouring a shot of aguardiente Nectar. Aguardiente (Spanish: [aɣwarˈðjente], aɣwarˈðjente (help·info) Basque: pattar [paˈcar], Catalan: aiguardent [ajɣwərˈðen], Galician: augardente [awɣaɾˈðente], Portuguese: aguardente [aɣwɐɾˈðẽt(ɨ)], English: "burning water") is a generic term for alcoholic beverages that contain between 29% and 60% alcohol by volume. The word is a compound word that combines the words in Latin-based languages for "water" (agua in Spanish; aigua in Catalan; água in Portuguese; auga in Galician) and "fiery" (ardiente in Spanish; ardent in Catalan; ardente in Portuguese and Galician). A similar English-based term is the slang "firewater". Both aguardiente and brandy—from the Dutch expression for "burnt (i.e., distilled) wine"—originated as terms for distilled spirits using whatever ingredients were available locally. By definition, aguardientes are strong alcoholic beverages, obtained by fermentation and later distillation of sugared or sweet musts, vegetable macerations, or mixtures of the two. This is the most generic level; by this definition, aguardientes may be made from a number of different sources. Fruit-based aguardientes include those made from oranges, grapes, bananas, or medronho ("cane apple"). Grain-based ones may be made from millet, barley, or rice and tuber-based aguardientes from beet, manioc, or potato, and finally what are classed as "true" aguardientes from sugarcane and other sweet canes, including some species of bamboo. Under this definition, many other distinct liquors could be called aguardientes, including vodka, shochu, pisco, and certain forms of hard chicha. According to Spanish and Portuguese versions of European Union spirits regulations, aguardiente and aguardente are generic Spanish and Portuguese terms, respectively, for some of the distilled spirits that are fermented and distilled exclusively from their specified raw materials, contain no added alcohol or flavouring substances, and if sweetened, it's only "to round off the final taste of the product". However, aguardiente and aguardente aren't legal denominations on their own. Instead, different categories of aguardientes (spirits in the English version) are established according to raw materials. In the Spanish version, wine spirit (brandy) is aguardiente de vino, fruit spirit is aguardiente de fruta, grain spirit (other than whisky and neutral grain spirit) is aguardiente de cereales, etc. Many aguardentes have a protected designation of origin, for example: Aguardente de Vinho Douro (wine spirit of Douro), Aguardente Bagaceira Bairrada (grape marc of Bairrada), Aguardente de pêra da Lousã (pear spirit of Lousã), Aguardiente de sidra de Asturias (cider spirit of Asturias) or Aguardiente de hierbas de Galicia (herbal spirit of Galicia). On 14 November 1996, it was concluded in analysis that cane aguardiente and cachaça are similar, but distinct, products. Cane aguardiente was thereafter defined in Brazil as an alcoholic beverage of between 38% and 54% alcohol by volume, obtained by simple fermentation and distillation of sugarcane that has already been used in the sugar-production process, and which has distinct flavour similar to rum. Cachaça, on the other hand, is an alcoholic beverage of between 38% and 48% alcohol by volume, obtained by fermentation and distillation of sugarcane juice which may have added sugar up to 6 g/L. Some drinks named aguardiente or similar are of different origin (grape pomace, sugar cane); other drinks with the same origin may have different names (klairin, brandy). In Brazil, a beverage known as cachaça or pinga, considered distinct from traditional aguardiente, is made from sugarcane. Cachaça, like rum, has two varieties: unaged (white) and aged (gold). White cachaça is usually bottled immediately after distillation and tends to be cheaper. It is often used to prepare caipirinha and other beverages in which cachaça is an ingredient. Dark cachaça, usually seen as the "premium" variety, is aged in wood barrels, and is meant to be drunk pure. Traditionally, no herbs are used to flavour the cachaça, and its flavour is influenced by the fermentation agent, time spent in the cask, or type of wood from which the barrel is made. In Colombia, aguardiente is an anise-flavoured liqueur derived from sugarcane, popular in the Andean region. Each department of Colombia holds the rights to produce it, but aguardiente produced in one region can be sold in another. By adding different amounts of aniseed, different flavours are obtained, leading to extensive marketing and fierce competition between brands. Aguardiente has 24%–29% alcohol content. Other anise-flavoured liqueurs similar to aguardiente, but with a lower alcohol content, are also sold. Aguardiente has maintained, since the Spanish era, the status of the most popular alcoholic beverage in the Andean regions of Colombia, with the notable exception of the Caribbean region, where rum is most popular. 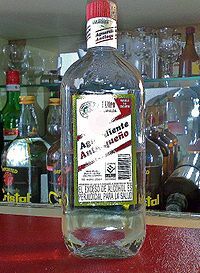 In general, aguardiente is rarely drunk in cocktails, and usually drunk neat. In certain areas of the Pyrenees in Catalonia aguardiente, known locally as (aiguardent), is used as an essential ingredient in the preparation of tupí, a certain type of cheese. In Costa Rica, aguardiente is known as guaro. In this form it has 30% alcohol and has a neutral flavour. Guaro is tightly controlled by the Costa Rican government to help prevent clandestine production. In Chile, aguardiente is an alcoholic beverage of 45% and higher alcohol content by volume (beverages with over 55% alcohol content by volume are illegal). It is made, like Italian grappa, by distilling the grape residue, primarily the skins and pulp (orujo) plus the stems (escobajos) and seeds, left over from winemaking after pressing the grapes. It is used to make several other flavored liquors, such as the murtado or enmurtillado (using sun dried murtilla, an orange-reddish wild rose fruit), the enguindado (soaking sun-dried morello cherries) and licor de oro (flavored with saffron and lemon peel). Dried mint, peeled walnuts, almonds, and other aromatic herbs are also used to flavor the aguardiente. It is mainly consumed by itself, or as a base to make cola de mono (monkey tail). In Ecuador, aguardiente is also derived from sugarcane, but unlike Colombia, it is left largely unflavoured. It is then taken straight as shots, mulled with cinnamon (canela in Spanish) and fruit juices to make the hot cocktail canelazo, or mixed with the juice of agave masts and Grenadine syrup for the hot cocktail draquita. Locally or artisanally made aguardiente is commonly called punta or trago, and alcohol content can vary widely, from "mild" puntas of about 10% to "strong" of about 40% or higher. The traditional distillation process produces aguardiente as strong as 60GL. Every Ecuadorian province has a slightly different flavour to the aguardiente produced there, and equally each province has a different recipe for canelazo. In Ecuador, aguardiente is the most commonly consumed strong alcohol. Aguardiente Astillero is one of the newest brands, which is becoming very popular due to its symbolic title especially around Guayas. Galicia, the northwestern region of Spain, is renowned for its quality and variety of aguardientes. Probably the most famous type is "Augardente de bagazo" (Aguardiente de Orujo), which is obtained from the distillation of the pomace of grapes, and is clear and colourless. It typically contains over 50% alcohol, sometimes significantly more, and is still made traditionally in many villages across Galicia today. Augardente de herbas, usually yellow in colour, is a sweet liqueur made with Augardente de bagazo and herbs (herbas), with chamomile being a substantial ingredient. Licor café (typical destiled drink in the province of Ourense), black in colour, is a sweet liqueur made with Augardente de Bagazo, coffee (café) and sugar. Crema de Augardente" or "Crema de Caña is a cream liqueur based on augardente, coffee, cream, milk and other ingredients. It is similar to Irish cream liqueur. In some places in Galicia, a small glass is traditionally taken at breakfast time as a tonic before a hard day's work on the land. The word orujo is actually Spanish and not Galician, but is used to distinguish Galician and some Spanish augardentes from those of other countries. In Haiti, a beverage known as '"Clairin" (Haitian Creole: Kleren), which is made from sugarcane. Clairin is clear, but it is often combined with fruits or roots to create something called kleren tranpe. In Mexico it goes by many names, including habanero. In the state of Michoacán, charanda is a traditional rum-like sugarcane aguardiente. Portuguese aguardente has several varieties. Aguardente vínica is distilled from wine, either of good quality or undrinkable wines. It is mostly used to fortify wines such as port, or aged to make aguardente velha (old burning water), a kind of brandy. Aguardente bagaceira is made from pomace as a way to prevent waste after the wine season. 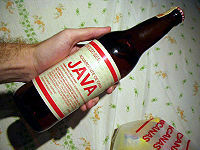 It is usually bootlegged, as most drinkers only appreciate it in its traditional 50% to 80% ABV. A common way to drink it is as a liqueur coffee made with espresso coffee; this is called Café com Cheirinho (coffee with a little scent). In the Azores, this espresso-aguardente combination is commonly referred to as café com música (coffee with music). 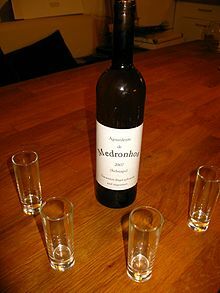 Aguardente Medronho is a variety distilled from the fruit of the arbutus unedo tree. In the Sardinian language the word for aguardiente is "Abbardente". It is also known as "Acquavite di Vinaccia" in Italian as it is made from "vinaccia", or grape pomace, and as such is often considered to be a type of grappa. It is also known by the Sardinian phrase "Filu 'e Ferru it:Filu 'e ferru" meaning "iron wire", as one was often used in decades past as a way to mark buried caches of the liquor that had been produced clandestinely. It comes in different grades from 40 to 60 percent alcohol. During the mission and rancho periods of California history, aquardiente was made out of mission grapes. It was popular during the Gold Rush of 1849. ^ "Regulation (EC) No 110/2008 of the European Parliament and of the Council of 15 January 2008". EUR-Lex. . See Spanish version here and Portuguese version here. ^ Klarreich, Kathie (2005). "Madame Dread: A Tale of Love, Vodou, and Civil Strife in Haiti". p. 64. ISBN 1560257806. Retrieved 19 April 2015. ^ Franz, Carl; Havens, Lorena (2006). The People's Guide to Mexico. Avalon Travel. p. 96. ISBN 9781566917117. Retrieved 15 February 2013. ^ "Lisboando – Guia de Lisboa". Retrieved 2012-08-17. ^ Charles Lewis Sullivan (1 October 1998). A companion to California wine: an encyclopedia of wine and winemaking from the mission period to the present. University of California Press. p. 3. ISBN 978-0-520-21351-7. Retrieved 24 November 2011. This page was last modified on 5 September 2015, at 06:37.